Boxing has Rocky, karate has The Karate Kid, football has The Great Escape, baseball has Moneyball, formula one has Senna, and dodgeball has Dodgeball, now mixed martial arts has Warrior, a tale of two brothers who against all odds face each other in the final of a winner takes all tournament, dealing with their fractured family in the process. Warrior is a film, which ticks every fighting movie cliché imaginable. Cocky fighter gets brought down to size? Check. A nobody gets thrown into the tournament at the last second? Check. An unbeatable Russian fighter turns out to not be so unbeatable? Check. Commentators who continually remind us just how miraculous the film’s events are? Check. A fight that looks lost but is then won? Check. Obligatory emotional motive for taking part in the tournament? Check. Warrior leaves no stone unturned in its two and a half hour narrative as every possible sports movie convention is used not once, but twice. Warrior tells the story of two estranged brothers. Tommy (Played by Tom Hardy) is a war hero who burdens incredible rage towards his father for being an abusive alcoholic during his childhood years, as well as towards his brother Brendan, who didn’t join Tommy and his mother in leaving their father. Brendan is a high school teacher with two daughters (One of which has a heart problem) while him and his wife have three jobs between them, if Brendan cannot make enough money they will be homeless, forcing him to engage in some nightclub fighting, which in turn gets him suspended without pay from the school. Meanwhile their father is now a thousand days sober and is desperately trying to become a part of their lives once more. 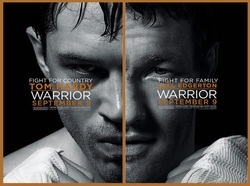 A mixed martial arts tournament named Sparta, with a cash prize of 5 million dollars gives Tommy and Brendan the arena they need to pay off their respective emotional debts, forcing Tommy to turn to his father as a trainer. As you may have gathered from that incredibly long plot OUTLINE, this is an incredibly contrived film. Warrior is a film where you don’t just have to suspend your disbelief but beat it to a pulp until it taps out. While all “Inspirational” sports dramas are contrived and cliché by design, it is more jarring in Warrior due to the intensity, realism and rawness of the outer ring drama. A more realistic take on the Sparta tournament itself would have been more in keeping with the tone of the human drama and made for a much braver, more memorable film. It’s ironic given that the final half of Warrior is full of punches, yet the film never pulls any of its own. It is also a film that could have done with a severe edit, as the film is incredibly overwrought and bloated. Both of the protagonists stories have one too many emotional hooks, for example did we really need to keep cutting back to Brendan’s principal and students supporting him? Sweet? Yes. Necessary? No. For a film which has marketed itself and been received as an emotional experience, I was surprised by how unmoved I was by certain movements of the film. It just felt like they were trying too hard at times, as the most hard-hitting scenes of Warrior are the more subtle ones. It is the performances that make Warrior the film that it is, with Tom Hardy, Joel Edgerton and Nick Nolte elevating the piece to another level than the script is on. Tom Hardy demonstrates once again why he is one of the most promising actors in the business. Along with this and Bronson, it is clear that there was only ever one choice for Bane in next year’s The Dark Knight Rises, where he is sure to reach the star status that he deserves. 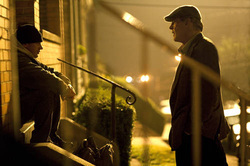 Hardy, who shares his best scenes with Nick Nolte, brilliantly portrays the rage to Tommy’s character. It’s strange but also rather telling that the most sympathetic character in the film is Nolte’s character, a man who we are continually told was despicable and who has been given none of the emotional back-story as his sons in the film. There is a scene in the latter half of this film between Hardy and Nolte, which is absolutely electric. It is the film’s finest scene and easily one of the more emotionally affecting of the year. It is a raw, intense scene without much dialogue and not intruded by music of any sort. The scenes between Hardy and Nolte are easily the films finest and while some of them may be a mumblethon, they are the scenes in the film, which really live up to its claims of being an emotional drama. This is not to say however that Joel Edgerton is not memorable in his role. While Tom Hardy and Nick Nolte have the more interesting roles, Edgerton gets the sympathies of the audience right from the beginning and maintains them. Both him and Hardy make the best out of scenes that could have been laughable in other hands and demonstrate that they will be commanding the screen for years to come. Gavin O Connor directs the fight scenes well and the way he builds up to the final fight is perfect. He gives the whole film a raw intensity with his close-up camera shots, his use of sound and editing. He gets good performances from his actors and it would be nice to see him combine again with these actors on a film that is more of a straight drama and one that doesn’t become a different film the further we get into the narrative. What is commendable about Warrior is the amount of time spent developing its characters, who are much more well rounded and explored than they could have been and while it would of been nice to see more edges to Edgerton, O Connor can clearly write and direct character and action. While the film never justifies its two and a half hour length, it never feels like two and a half hours, which is a massive compliment. For a film to be that long and not to feel it, is a feat that many films cannot achieve. There are films shorter than Warrior that have felt much longer and in that sense the film is paced well, with all three of the principal actors keeping your eyes glued to the screen with their performances. While the film’s conclusion may be too on the nose and/or open-ended for some, the final shot was the perfect one upon which to end the film. Overall Warrior is an overwrought, contrived and cliché ridden film yet an incredibly well acted, gripping, efficiently directed overwrought, contrived and cliché ridden film. Hardy, Edgerton, Nolte and O’ Connor’s direction make Warrior a gripping, satisfying watch despite its bloated and contrived screenplay. Colten Bengs says "Nick Nolte plays the best role I have ever seen, period."